Julia Trigg Crawford has used every available legal avenue to keep TransCanada from seizing her family farm for its toxic Keystone XL pipeline. Her story is a classic David and Goliath struggle of a Texas farmer standing tall against a multi-national corporation. To help in her fight against this corporate giant and mounting legal fees yesterday she hosted a benefit concert “Stand Tall With Julia” at the Crawford Family Farm near the Red River in northern Texas. “STAND TALL WITH JULIA” , GEVECHT TEGEN DE TEERZANDEN KEYSTONE PIJPLIJN IN NOORD TEXAS! Julia Trigg Crawford heeft iedere wettelijke weg bewandeld om TransCanada te beletten haar familieboerderij in te palemen voor zijn giftige Keystone XL pijplijn. Haar verhaal is het typische David en Goliath verhaal van een strijd tussen een kleine boer tegen een multinational corporatie. 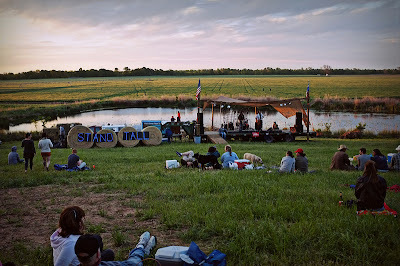 Om haar in de strijd tegen deze corporatie reus te helpen en de rechtskosten te betalen heeft er een benefiet concert “Stand Tall with Julia” plaats gehad op de Crawford familie farm nabij de Red River in Noord Texas.